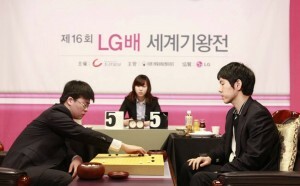 Collecting his first international title, Jiang Weijie 5P of China defeated Lee Changho 9P of Korea on February 15 in the final of the 16th LG Cup. The final started on February 13 and Jiang won the first game by resignation after unexpectedly killing a large white group late in the game. In Game 2, it was Lee who was on the attack. He put the 20-year-old Jiang through a severe test, but eventually resigned after 232 moves. Jingning; based on her original article: Jiang Weijie wins 16th LG Cup at Go Game Guru. 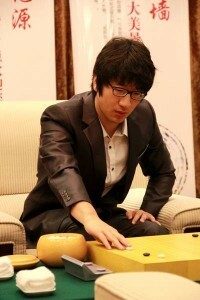 Photo: Jiang Weijie 5P (left) plays go legend Lee Changho 9P.